The City of Avondale Estates was recognized at the annual Georgia Main Street luncheon January 26 as one of 17 communities that graduated from the Georgia Main Street Start-up Program in 2015 to receive the national designation of a Classic Main Street Community. Graduation from the Main Street program means statewide and national recognition for Avondale Estates, according to City Planner and Community Development Officer Keri Stevens. “We have access to a large network of professionals, including low- or no-cost design services, technical assistance and very low-interest loans for businesses and building rehabilitation,” said Stevens, who manages the Main Street program for the City. 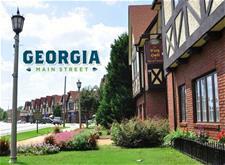 In the fall of 2013, the City of Avondale Estates was selected, out of 25 applicants, to participate in the largest Main Street Start-up class in the history of the Georgia Main Street Program. Over the 14 months that followed, the City worked closely with the Office of Downtown Development at the Georgia Department of Community Affairs to prepare the Avondale Estates community, downtown business owners, volunteers and elected officials for the journey ahead. Through downtown development training, community visioning sessions and capacity building activities, the City of Avondale Estates’ newly designated Main Street program is now ready to meet and exceed the guidelines for the 10 National Standards for Accreditation, as laid out by the National Main Street Center. Billy Peppers, Director of the Office of Downtown Development, applauded the new Main Street cities. Robert James is a small business owner in downtown Avondale Estates, a City resident, and chairman of the Downtown Development Authority, which also acts as the City’s Main Street Board. The Main Street design services will be a boon for the City, according to James. James added that the ability to network with other Main Street cities is also a useful tool. “It gives us an opportunity to speak with people who have completed projects that we’re interested in instigating,” he said. For more information regarding the City of Avondale Estates Main Street Program, visit the City's Main Street page.